The Fashiondex, Apparel Industry Publishers, was started in 1992 by a fashion designer who had arranged her Rolodex into types of fabrics and trims, instead of from A to Z. When she noticed that everyone where she worked was using her Rolodex when they needed to do their research and sourcing needs, she saw there was a need for a similar product. Fashiondex was formed, that “Rolodex” was reproduced in book form, and several months later the first “Fashiondex” was produced. We started selling that directory and eventually created and published many other books that our designer, and her industry friends, thought were needed to make their jobs easier. 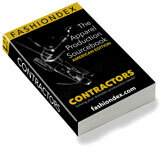 In 1994, we launched www.fashiondex.com, the first fashion-sourcing website and store. The Fashiondex, Inc. and its online store, www.fashiondex.com, now continue with the same goals they had as a resource guide company back in 1992. A goal to create the most up-to-date, well-formatted and easy-to-use design-industry sourcebooks available, along with publishing the best industry tools and books available, for all those in, and entering, the design industries. Our sourcebooks are unique, as they do not involve cross-referencing and leafing through pages and we've kept the books small, so you can keep it on your desk, or throw it in your backpack or totebag. We contact all suppliers listed in our sourcebooks two times each year, to keep the book and our customers as up-to-date as possible. Designers and manufacturers have been using our books, reordering and spreading the word about how useful they are, for over 19 years. We continue to come out with new titles, while looking for other useful tools for our customers, from other publishers. We want our customers to have the most up-to-date and exciting tools available, to help in all their design, sourcing and manufacturing needs.